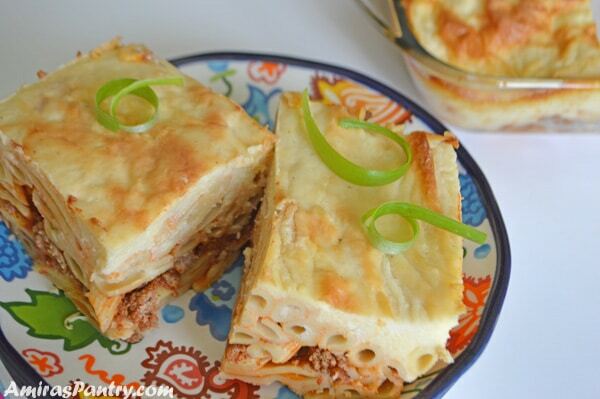 Ladies and gentlemen, pasta lovers, may I present to you, the Egyptian version of baked pasta with bechamel. One of life’s true pleasures, a comfort food that only pasta lovers will appreciate. 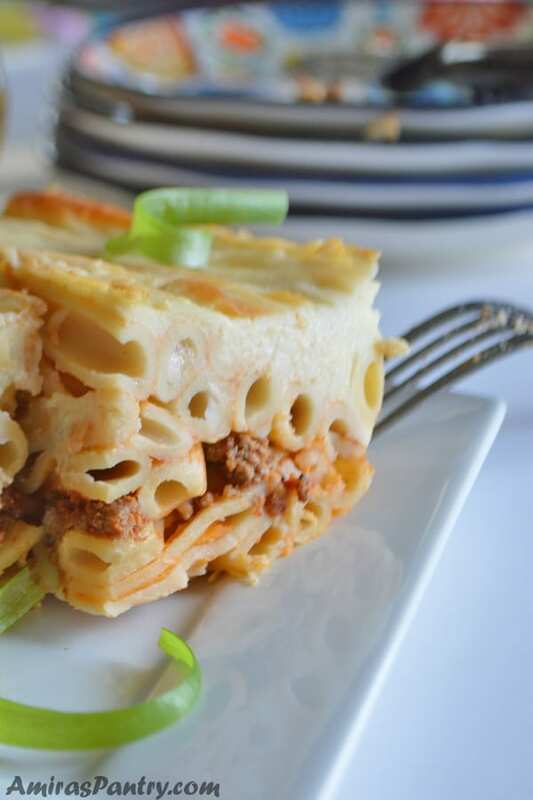 Layers of pasta and – a little tangy – ground beef stacked together then topped with thick, brown and bubbly bechamel sauce that is not runny but not dry too … what else can you look for?!!. This is a very common dish in Egyptian banquets specially in holidays. A one dish meal, all you need is some salad to go along but nothing more I promise. Be aware that this dish is really addictive and not for dieting people. You can make it healthier though, by using a whole wheat pasta and making the bechamel with whole wheat flour also substituting butter with olive oil. 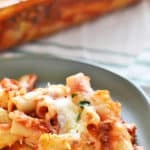 This pasta can easily serve a crowd and – aside from making the bechamel- just takes 10 minutes to assemble, kid friendly and filling. 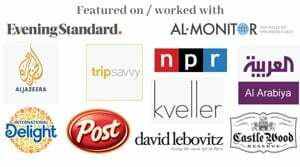 Before we get elbow deep into the recipe, there are a couple of findings that I would like to mention. One of my friends recently stated that her mom does not cook with any fats, I was shocked . She mentioned that particularly this recipe, which always calls for a serious amounts of fat, she only roast the flour in the pan without any butter or oil. Of course, if you do that you will greatly jeopardize the taste. But this is a solution for people who miss this dish and cannot make it because of the amount of fat. Frankly, if it was for me, I would make it as is… full fat and just take one serving and that’s it. But anyways I wanted to mention this as it might help anyone out there. Another thing is, I love having enough sauce so I make bechamel with 5 cups of liquid. Many people find 4 cups enought. It is just my preference. So let’s see how to make it work. First, we’ll need to cook the pasta according to package directions, try to aim for an al dente level of cooking as the pasta will then continue to cook in the bechamel sauce in the oven. You can make this recipe gluten free by using something like rice pasta and of course use gluten free flour. I have no experience with gluten free cooking but I think you’ll need to adjust the liquid amount accordingly. Now, we’ll prepare bechamel sauce, some people like to add the flour to the liquid in a blender and then heat it up to thicken along with some butter. This way they ensure no lumps form. Cooking flour in butter/oil has another depth of flavors which I ,among many others, like so I prefer this method. Just use your whisk when you cook the flour and when you pour in the liquids to ensure no a smooth sauce. For the ground meat, saute onions in a pan then brown the meat, drain fat and near the end add some tomato paste, season and mix. Very simple and straight forward. 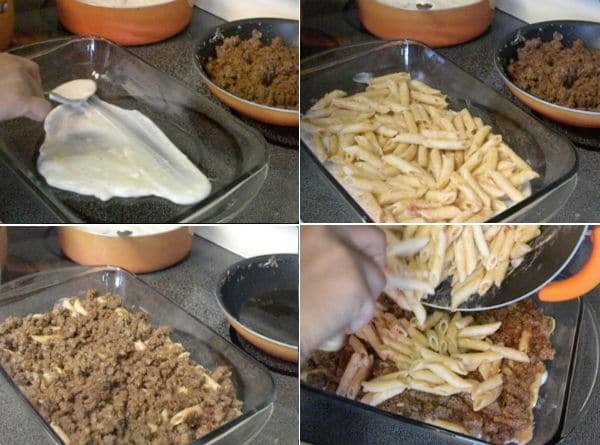 Take some of your prepared bechamel and spread it evenly at the bottom of a 13×9 baking dish, then top that with half of the pasta mixture. Layer minced meat over then top all of that with the remaining half of the pasta. 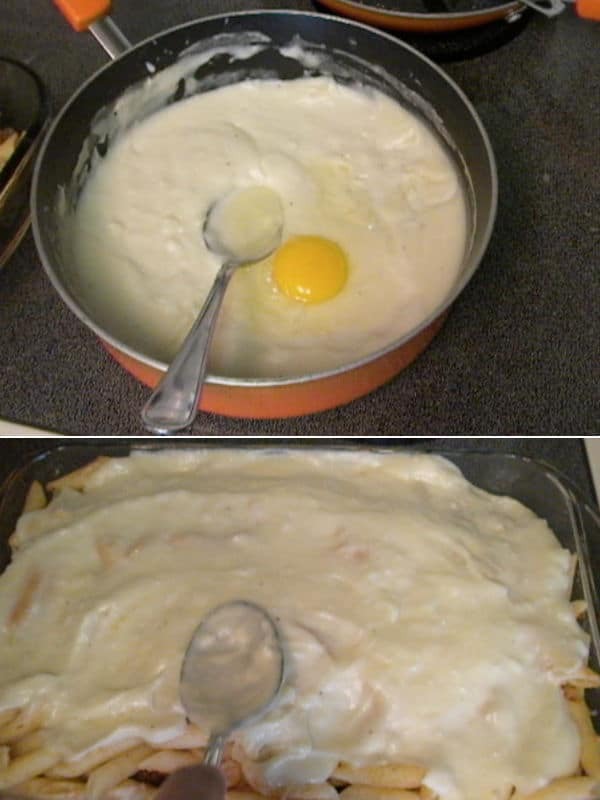 And then add one egg to the rest of the cooled bechamel sauce and mix well. This egg is optional, I like adding it as it helps brown the top nicely. Pour all this remaining bechamel over the top end even the surface. Pop in a preheated oven until it is bubbly and nicely browned. Let it cook down for like 30 minutes so you will be able to handle better. Cut and serve with your favorite salad. A serious comfort and warming food especially in this cold weather. 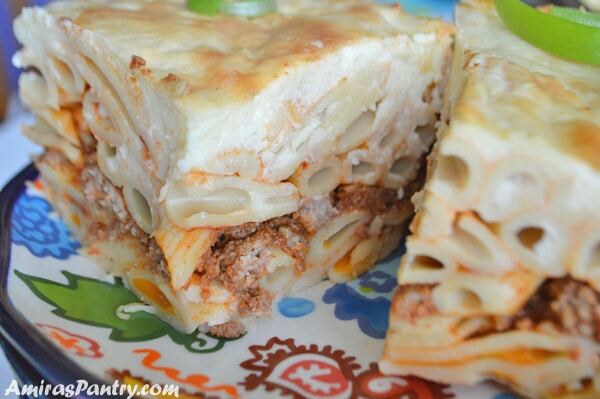 Browned ground meat sandwiched between two layers of saucy pasta and topped with a thick luscious béchamel sauce. Cook pasta according to package directions, try to make it a bit chewy as it will continue cooking in the béchamel sauce in the oven. Drain and do not rinse. Add a tablespoon of oil to the pasta and stir to combine. Check seasoning of the pasta, adding more salt and pepper if you like. In a pan over medium heat, add 2 tablespoon of oil, then sauté onion until fragrant, about 1 minute. Add ground meat and brown. Drain fat and add 2 tablespoons of the tomato paste, mixing everything well together. Continue cooking for a couple of minutes more. Season with salt and pepper. In a pan over medium heat, melt butter, add flour and whisk so no lumps form. Keep cooking the flour until it starts to bubble. Add the liquids gradually, one cup at a time whisking vigorously as the sauce will thicken. When it is bubbly and thick, turn off the heat, season with salt and pepper and let it cool down. Add the remaining 2 Tablespoons of tomato paste to the pasta and about half a cup of the béchamel sauce and mix well. In a 9×13 oven dish, spread another 1/2 cup of the béchamel sauce evenly at the bottom. Spread half the pasta , then layer the entire meat mixture over the pasta. Top that with the remaining half of the pasta and level. Let it cool down, cut and serve. * Use any pasta shape you have, traditionally it is made with penne. You can make it gluten free by using rice pasta. ** For the liquids used to make béchamel sauce, I prefer using half milk and half broth, any brith you have. 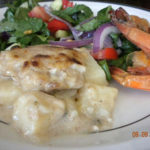 If you like it extra saucy and creamy, add another cup of liquid so the total will be 5 cups, but do not forget to add 2 more Tablespoons of flour and another Tablespoon of oil or butter. 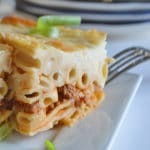 *** To get pasta squares that holds its shape while serving I use 3 Tablespoons of flour for each cup of liquid. If you care more for a liquid sauce that will be oozing from everywhere and a fall apart pieces use 2 tablespoons per cup of liquid. Some people even use one tablespoon but I’ve found that following this makes the béchamel sauce so runny and it sinks to the bottom of the dish leaving dry pasta up. **** If you want a lighter version use all oil, olive oil or vegetable whatever you like. I’ve seen some people do not use fat AT ALL, they just roast flour in the hot pan then add the liquids, this might be a good option for people with health issues regarding fat, but of course taste will be different. ***** Some like adding mozzarella or parm. 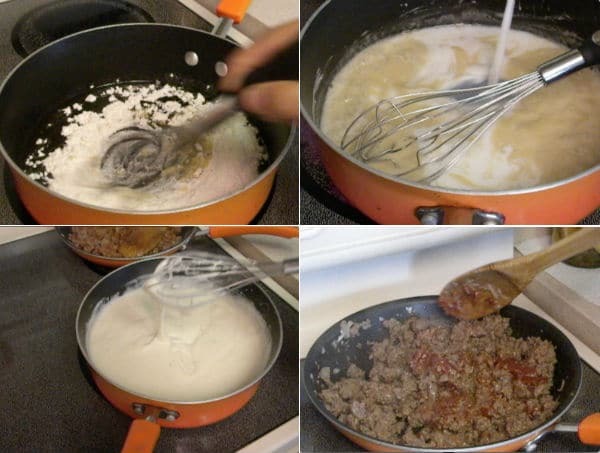 Cheese to the béchamel sauce or mixing them with the pasta itself. I like doing mine as my mama used to.. plain. Pumpkin Béchamel .... the Egyptian style. An excellent recipe, followed it exactly and turned out just how I remember it. Thank you so much. Thanks Safie for trying this out, I am happy you liked it. Yumma dear, I saw your question on the roqaaq recipe and replied you can you please check it out? Thanks.